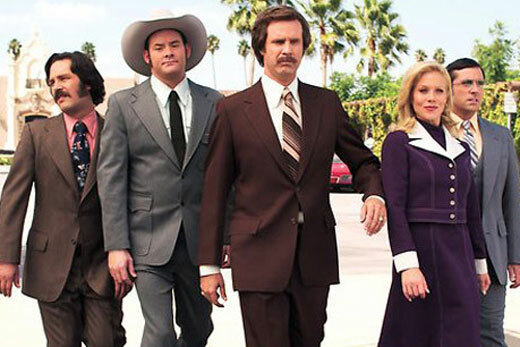 The sequel to "Anchorman: The Legend of Ron Burgundy" (pictured here) is coming to theaters December 2013. Courtesy photo. Four Emory film studies majors spent spring break watching movies – from the set. The students had the opportunity to serve as location production assistants during a day of filming "Anchorman: The Legend Continues" at Emory's Briarcliff Campus. The sequel to the 2004 comedy "Anchorman: The Legend of Ron Burgundy" is filming in various locations around Atlanta this month. Reuniting an all-star cast including Will Ferrell, Christina Applegate, Paul Rudd and Steve Carell as an oddball crew of 1970s newscasters, the movie is coming to theaters in December 2013. Atlanta filming locations for "Anchorman: The Legend Continues" included Emory's Briarcliff Campus. Photo by Kim Urquhart. Paramount Pictures selected the mid-century modern architecture of Briarcliff Building A as a filming location for its period ambiance, says Ed Moseley, finance director for Emory's Office of Communications and Marketing who helped negotiate student participation as part of the deal. The students, all from Emory College's Department of Film and Media Studies, said that their Emory education provided them with a foundational understanding of the production process. "We were prepared, but I think having this exposure to a real movie-making set definitely opened our eyes to what we're getting ourselves into," says Jennifer Harvey, an Emory senior majoring in film studies. "That exposure to the realities of production is really crucial for creating a deep and well-rounded understanding for film as a medium," says Eddy Von Mueller, film and media studies lecturer. From a 12-hour shift on the day of filming at Briarcliff, to helping set up signage around town for additional filming locations, the students spent the entire week of spring break working with the Paramount Pictures Location Department. Says Location Manager Gerard Averill of the students: "They were extremely helpful, and played an intricate part in making this film." The students' participation in the "Anchorman" sequel was an extracurricular activity, but the experience is priceless. "These opportunities are invaluable in terms of providing skill-building and networking opportunities — and a measure of practical perspective," says Von Mueller. For the students who are in Von Mueller's "Narrative Filmmaking" course, "This will bounce straight back into class in the form of a better understanding and a more serious-minded approach to some of the things that student filmmakers chronically underemphasize in their work, like organization and planning," he says. And, he adds, it "will serve to enhance and make deeper some of the practices and processes that the class is trying to teach them." The students did not get to work directly with the stars, but did get to observe them in action. "I had the embarrassing experience of hearing that Will Ferrell was walking down the hallway and speedily peeking my head around the corner, then whipping back around to make it seem like I wasn't excited to see him. I'm sure he saw that!," laughs Harvey. Harvey did get a chance to spend time with the sound mixer on the set, and could see what the cameras were shooting during one scene with Ferrell. The "Saturday Night Live" funnyman was famously improvising: "In three takes, each only had about two lines that were the same, so I got to see him at his work of creating comedy without a script. That was a real treat for me," she says. The explosion of filming in Atlanta, thanks to tax incentives and a deep pool of local talent, is bringing the Hollywood experience closer to home. "We are eager as a department, and for students in our concentration in film and media management (a joint program with Goizueta Business School), to connect our students with film and TV opportunities," says department chair Matthew H. Bernstein, adding: "We are in the planning stages of creating more such opportunities through internships." "For an extraordinary occasion like this, we are greatly indebted to the University for insisting that students play a role in and around the set," Bernstein says.